Answering these questions should be a collaborative effort involving the entire team. That's because drawing lines of accountability and responsibility requires surgical precision and a shared knowledge of the team's strengths and weaknesses, as well as the organization's formal and informal chain of command, power structures, available resources, etc. Without these clear role definitions, the project could lurch along contentiously, miss deadlines, create the wrong (or poor quality) deliverables and burn through time, money, and organizational good will. So it's well worth the time, right up front, to engage these issues as a team. But this can be a complicated set of conversations! So where do you begin? The table below can serve as a framework for your discussion to help you get started. It includes some generic project roles (project leader/manager, core team members, sponsor/customer, stakeholders) and some generic project steps, represented by the PM Minimalist's 10 Steps. 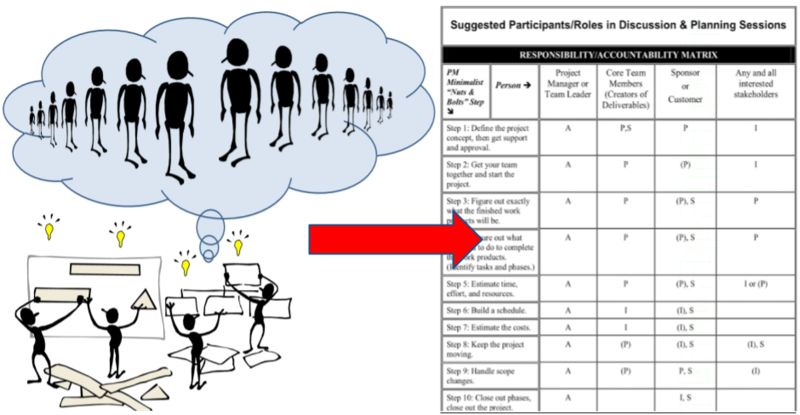 It's up to you to decide if the assignments identified here (i.e., "A" for accountable, "I" for input required, etc.) translate to your project and organization. Like all the Project Management Minimalist tools, it's designed to be a springboard to help you "hit the ground running!" You're expected to add, delete and change it to make it your own. Enjoy! NOTE: This tool is based on the PM Minimalist's 10 Steps. It appears exactly as shown in The PM Minimalist Mentor: Scripted Coaching Tools to Guide Your Project Team. 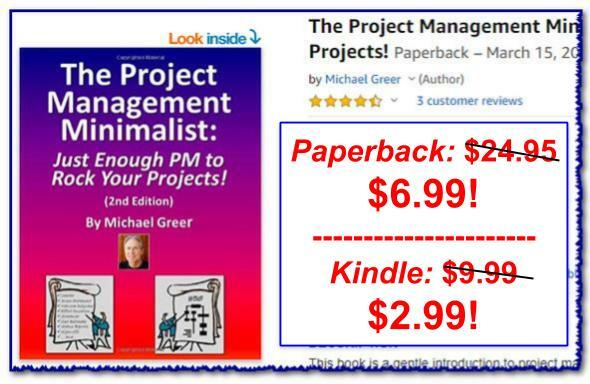 To learn more Minimalist techniques for organizing your team, see "Step 2: Get your team together and start the project" in The Project Management Minimalist: Just Enough PM to Rock Your Projects! ... And check out the entire PM Minimalist Support System and Freebies collection for plenty of free stuff, including videos, audios, PDFs and more!